Chin posits that a better understanding of genetic information not only enables the linking of genetic identity to conceptions of disease, treatment and prevention, but offers the possibility of using information mining techniques (such as comparison with bodies of data about environment and lifestyle, and stratification of information) for refining disease classifications, refining risk assessment by determining individual risk, and targeting treatment and preventive behavior. Much of the attraction of precision medicine, in Chin’s view, is driven by glimpses into the complex base of human life, the desire to understand current health statuses and future health implications, and the concentration of power in big data. This evolving metaphor is bound up with other important ones, including powerful stories of people wishing to have or not have knowledge about future health, depending on how such choices and their ramifications are framed in their context. 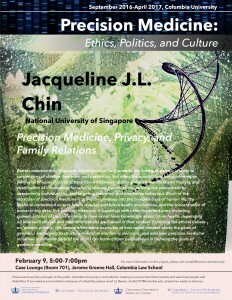 Exploring the ethical debate on ‘genetic privacy’, this lecture offered some examples of how social debates about the goals of genomics are helping to structure individual and family decisions. Chin asks how precision medicine initiatives in different parts of the world can foster citizen participation in defining the goals of genomic medicine.